Glasgow Airport, located near the town of Paisley to the west of Glasgow, is the largest airport in western Scotland. Our Glasgow Airport guide includes contact details, as well information relating to terminal facilities, public transportation and nearby hotels. The construction of a tram-rail link between the airport and the city centre is currently at the planning stage. If given the go ahead the service would likely be operational by 2025. Glasgow Airport's information desk is on the first floor, next to the domestic arrivals/departures area. Additionally, there are computer information kiosks on the ground floor and a Visit Scotland tourist information office (tel: +44 141 566 4089) in the domestic arrivals area – this provides information on local attractions and accommodation. From central Glasgow, take the M8 motorway westwards to Junction 28. Glasgow Airport is clearly signposted from this point. The total drive time to the airport from central Glasgow is approximately 25 minutes. The two terminals are connected via a short covered walkway. Glasgow Airport is located 13.8km (8.6 miles) west of Glasgow city centre. Bus: Glasgow Airport Express (tel: +44 141 420 7600; www.firstgroup.com/) operates 24 hours a day between Glasgow Airport and the city centre (journey time: 15 minutes; fare: £7.50). Buses are also available to other destinations. For more information on bus travel in the area, contact Traveline Scotland (tel: +44 871 200 2233; www.travelinescotland.com). Taxi:Metered taxis are available 24 hours a day. The taxi rank is immediately outside the terminal building. The fare to the city centre is around £25, and the journey time is approximately 20 minutes, depending on traffic conditions. Rail:The Gilmour Street Railway Station in Paisley is around 2.4km (1.5 mile) from Glasgow Airport and only a few minutes away by taxi or local bus. Trains run to Glasgow Central (journey time: 10-15 minutes; fare: £3.50). For more information, contact the 24-hour National Rail Enquiries line (tel: +44 345 748 4950; www.nationalrail.co.uk). Bureaux de change and ATMs are located either side of the security screening point. Foreign currency can be pre-ordered through Travelex and picked up at their Glasgow Airport branch, housed within the terminal. A good choice of restaurants, cafés and bars is concentrated on the first floor, after security. A number of options are also available pre-security, including a sports bar and a pub. Shopping at Glasgow Airport includes duty-free outlets for passengers travelling to destinations outside the EU, as well as retailers selling a range of items, including newsagents, specialist Scottish-themed gift shops and fashion outlets. The left-luggage office is situated in the check-in hall and a lost property service is available (tel: +44 330 223 0893 [for both services]). A database is available allowing passengers to search for lost items online (www.airport-lostproperty.com). Uniformed members of staff are on hand to assist with baggage. Other facilities at Glasgow Airport include a pharmacy, prayer room, baby-care facilities and children's play areas. A business workstation with telephone, fax and internet facilities can be found on the first floor. The Glasgow Airport Business Centre (tel: +44 141 847 5450) is located next to the terminal building and provides meeting rooms, conference facilities and full secretarial support. The UpperDeck airport lounge is available to all passengers for a fee, and offers free internet access, complimentary drinks and newspapers. Conference and meeting facilities are also available at some nearby hotels, including the Ramada Glasgow Airport (tel: +44 141 843 4800; www.ramada.co.uk) and the Holiday Inn Glasgow Airport (tel: +44 871 942 9031; www.higlasgowairporthotel.co.uk). Free Wi-Fi internet access (for up to 60 minutes) is available throughout Glasgow Airport. There are also fixed internet kiosks and work desks in various convenient locations. A postbox is located in the check-in area and payphones are located throughout the terminal. Facilities for disabled passengers include wheelchair-accessible toilets, ramps, lifts and reserved car parking. For the hard of hearing, there are induction loops, TDD telephones and a Minicom information line (tel: +44 844 571 7410). Passengers should advise their airline in advance of their needs and those requiring assistance from the car park to the terminals should arrange this in advance by contacting the PRM service provider (tel: +44 141 842 7700). 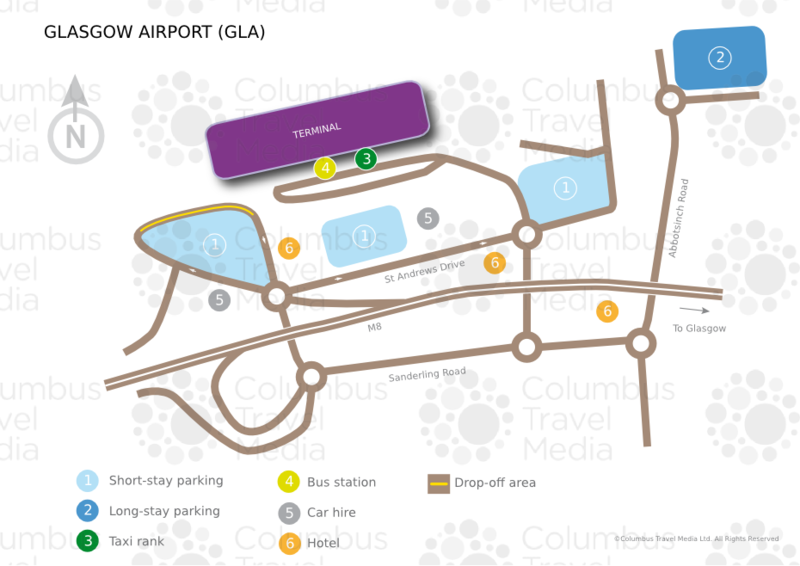 Short-stay, long-stay and business parking is available at Glasgow Airport. The short-stay car parks are within walking distance of the terminals, while there are regular transfer coaches to the terminal from the long-stay car park. Discounted long-stay parking can be pre-booked via the airport’s website. A fast-track service is available in the short-stay Car Park 2 for a higher fee. For any parking queries, contact the airport’s parking office (tel: +44 345 050 7080). Car hire operators: Alamo, Avis, Budget, Dollar, Enterprise, Europcar, Hertz, National and Thrifty are represented at Glasgow Airport. These companies have desks near Domestic Arrivals.